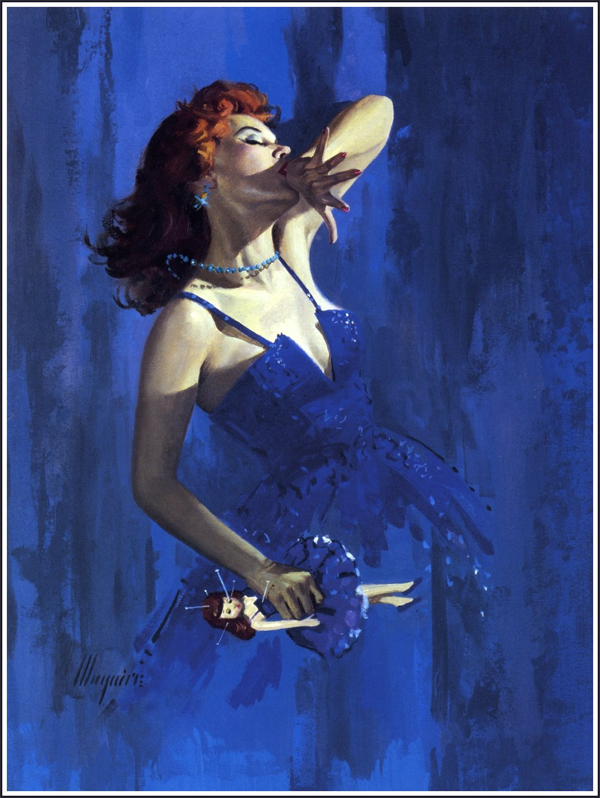 Robert Maguire, born in 1921 in New Jersey, painted over six-hundred paperback covers during a more than fifty-year career, mainly featuring luridly sexual females, for publishers including Pocket, Dell, Ace, Harper, Avon, Silhouette, Ballantine, Pyramid, Bantam, Lion, Berkeley, Beacon and Monarch. He made three to four thousand dollars per cover from Pocketbooks, for a time earning over one hundred thousand dollars a year. He also did work in watercolor for Norcross Greeting Cards, including Christmas cards of Santa Claus. As a child, he was taught to draw by his father, an architectural draftsman, with drawing "contests" between them to see which of them could better draw a newspaper photo. That was some feat to paint all those paperbacks. most talented. I like the fascinating mixture of blue in this revealing painting. His father was awesome because he nurtured his love of art instead of crushing it in favor of more practical work. That's wonderful. That's some serious money for his day! Stunning work!